Welcome to our blog hop with JustRite® Stampers! We’re so excited to show you what we’ve been working on over the past couple of weeks! We’ll also be giving away a prize every day (3/18 ~3/19)! 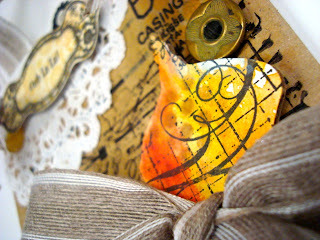 Before I show you the prize pack, let me share my project I did with the stamps and Design Memory Craft's products. I created a wall hanging with the adorable Grandma's Attic Background stamp and Ooh La La French Frills Stamps. Using Faber-Castell's Textural Accents gel medium, I adhered sewing pattern tissue paper to the chipboard piece. I stamped with Stamper's Big Brush Markers in black and they came out so crisp and gorgeous! Gelatos from the 50's Diner set added color to the dress form and hexagons. I hope you liked my wall-hanging and will continue the hop! Here are the prizes you could win! Leave me a comment and make sure you visit the other designers and main sites! The blog posts for the hop will be released on 3/18~ 3/19. You have until midnight EST, on March 22nd to complete the hop. Just follow the links below- be sure to leave a comment on each post. That way, we’ll know you were there. Happy hopping! Want an extra chance to win a prize? Tweet us at @DesignMemCraft and @JustRiteStamper! Gorgeous project! Soo vintage, love it! Love the project. I'm getting so many ideas for using the Faber-Castill "paints". Have to get busy using mine. Wow...This is so amazing. 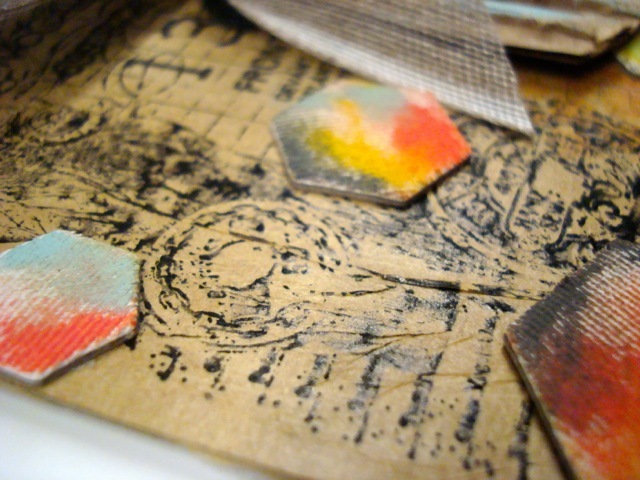 I love the mixed media feel. Wonderful job on this. 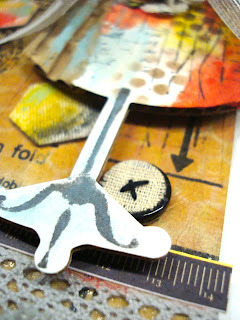 Wow, I love all the texture and layering on this project! Great job! Your wall hanging is stunning. WOW -- this is sooo FABULOUS with the pattern tissue paper BG!!! It would be perfect hanging in my sewing room -- however did you know those were my colors -- LOL -- LOVE your creativity!!! What a colourful wall hanging! I think I "need" some Gelatos now! Beautiful project, love all the layers of colors and textures, perfect wall hanging, it will a touch of class to any wall. I too, need to get some Gelatos. Thank you for sharing. This is so pretty. Love the textures. Great job! What a fantastic wallhanging! So much yummy stuff to look at and the colors blow me away! 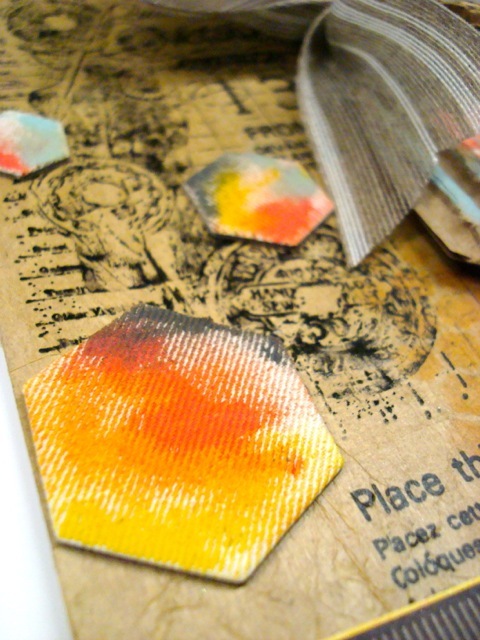 Love the idea of using pattern tissue paper for this project. Very genius! It has the "old timey" look. Very pretty. Such a cute wall hang! Love the colors! Ooh La La - very chic! Love the colors, love all the details. Fun project. Love how the sewing theme ties in. This is an awesome wall hanging. 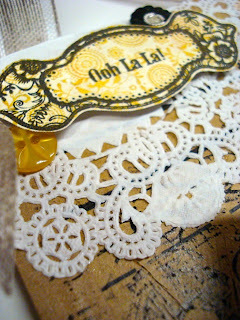 I love the French style and the background stamp is awesome. I love all you did to this wall hanging and looks like a quick project. Thanks. This is such a cute wall hanging. Makes me want to make one. Great project, Jen, and thanks for sharing it! Your wall hanging is gorgeous!! Love the vintage look it has!! What a really neat dress form! Thanks for sharing yoru technique. Lovely colors, and I like the bit of lace that peeks out! This is adorable Jen! I love the dress form and the way you layered the pattern piece! Such a great technique - thanks for inspiration! The orange is a great touch. I LOVE the look. Quite unique, Jen! I love this project. Thanks for sharing your process. Ooh la la this is just gorgeous. Nice job with the colors. Wow! This is FABULOUS!!!! Thanks so much for the wonderful inspiration. So pretty! Love the inspiration! Just beautiful.. I lov this whole hop I'll be back tommorrow tooo. I need that diner's set-great colours! My list of blogs to revisit and supplies to get is getting longer=)! Thanks so much for the inspiration! Beautiful idea of a wll hanging. Great use of media. Oh how I can see spending a little more money. Wonderful and pretty. I just love how you used Gelatos for this project. It is SO pretty! I love the shabby-chic-ness of your wall hanging. Wonderful colors - it all blends together just perfectly! Thanks for sharing and for the chance to win. The colors are so beautiful and so vibrant. Thanks for your tutorial and another chance to win! Great wall hanging Ooh La La! Very pretty! Cool wall hanging! Great colors! So many cute elements. Hope I can remember them all. Very cool project! Love the colors you used and the materials that the gelatos worked on. Thanks for sharing. love the wall hanging and the bright colors. WOW!!!!! I love the detailed work that you have done. Amazing. Warm colors and embellishment. Very nice. Very vibrant wallhanging. Out of the box idea and I love it! Lots of cool ideas packed into that one little hanging. Great job. This is so beautiful!! The colors are gorgeous!! What a fabulous project!! Very cool project. Great attention to detail. So pretty! I love all the textures and the bright colors. That textural accents gel medium is really cool! I love the vintage theme of this project! The colors are great, too! Beautiful card! Totally my style! I love it! Thanks for the inspiration! Another awesome project by you!! 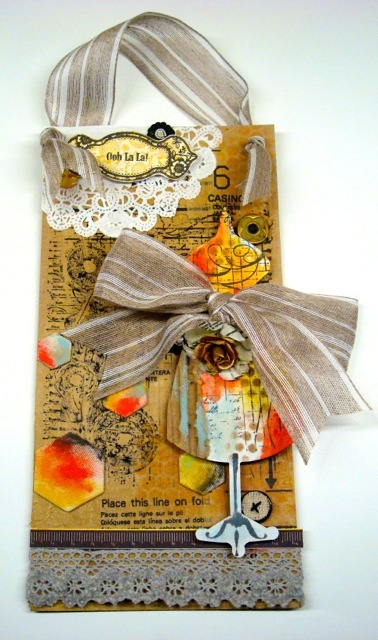 I absolutely love all of the stamps that you used on this. I have got to get some of the metallic gelatos in the colors you used on this...they are beautiful and blend so well together. Thank you so much for sharing your lovely wallhanging,tutorial and ideas. Ooohhh this is oh la la! This is so pretty! Love the pops of bright colors against the neutral backdrop. What an awesome wall hanging piece!!! love the colors and texture! Beautifully detailed piece of art! Your look is so different from what I've seen so far. Really cool! Great wall hanging. Love the uniqueness.